Simply enter the dimensions of the area you need to pave. Select your tile size, the laying pattern and hit calculate, it’s that simple! 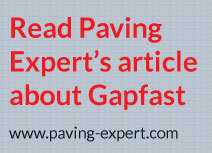 If you are laying a PATIO PACK typically you will require 2 bags of Gapfast Tees. However, given the vast array of patio packs available from all the paving manufacturers please contact us first and we will advise you of the exact number of Gapfast you require. Gapfast come in bags of 50, and are priced at £11.99 / bag, includes FREE P&P (UK Mainland only). Gapfast are sent next business day dispatch via Royal Mail 1st Class post.